A text book depression / low pressure system approaching the UK from the west might signal the beginning of the end for this long run of bad weather. It’s a big low pressure system tracking NW rather slowly and will take all weekend to clear off but most of the rain will fall in the west and not much will reach Reigate. The warm front is due to pass over Reigate around midday on Friday bringing some brisk SW winds and cloud and some light rain. The “warm sector” following the warm front comprises an air mass called “Tropical Maritime”, bringing balmy +10°C temperatures to Reigate over night Friday through to Saturday morning. 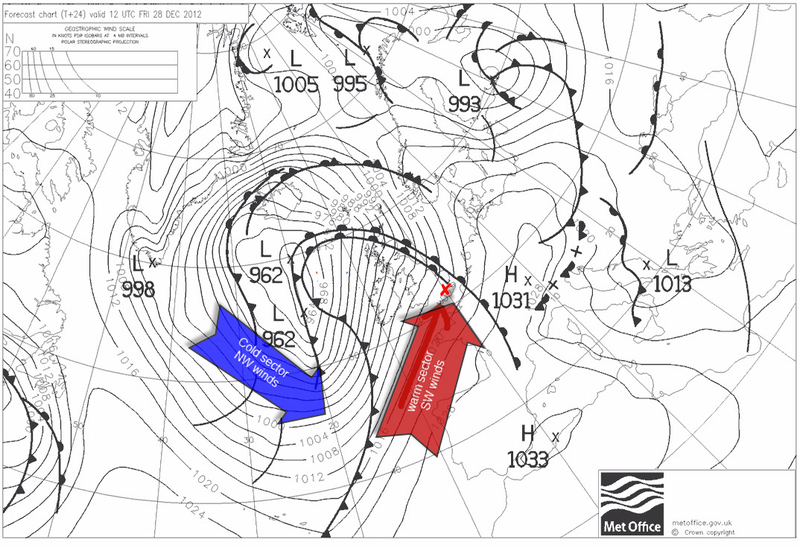 The cold front is due to pass over Reigate after lunch on Saturday when temperatures will drop by several degrees to 3°C overnight . Despite the slow movement of the depression as a whole, winds will be pretty strong especially as the cold front passes. The cold front will bring gusty winds, possibly up to 50mph on Saturday morning, and heavier showers on a cooler NW wind. The air mass following a cold front is called “polar martime” and will feel significantly cooler in the wind, even in sheltered Reigate. There are signs that a HIGH pressure will build up over the south of the UK by the new year week bringing drier weather, at last! The ensemble forecast below shows a drier spell to start off 2013. An ensemble forecast is one which combines several computer weather forecasting model “runs” and sees how well they match. The closer the match, the more confident the forecast and more probability that it will be correct. Each “model run” is “perturbed” which means tiny differences in starting data are used to simulate the error and vagaries of real chaotic weather systems.